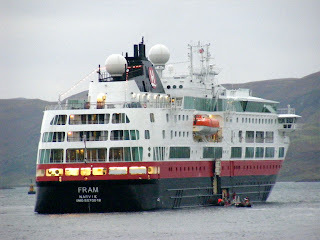 Hurtigruten's liner Fram arrived in Oban Bay 27 September 2008. Disembarking passemgers by flit boat to the Oban Times slipway. Caledonian Macbrayne's Lord of the Isles passing enroute to Coll.